Greetings from sunny Tucson, Arizona! My name is Martha Retallick, and I'm the author of Finance for Freelancers. I wrote this book to make financial and accounting concepts fun and friendly. Since we freelancers are going to have to deal with these things, we might as well enjoy the experience, right? Okay, I hear what you're saying. You're a creative person, not a numbers person. You'd do anything to avoid dealing with the financial side of your business. Don't worry, this will be painless. And you might even find yourself turning into a numbers geek. And why not? It's your business that we're talking about! INTRODUCTION: Why does finance have such a bad name? Truth be told, a lot of creative freelancers don't like to deal with the financial side of their businesses. This can lead to bills stacking up. Checking accounts going unbalanced. Invoices not sent. Clients not paying. (How could they possibly pay you if they don't know what they owe?) And, worst of all, when someone asks how your business is doing, you have no idea. Does this sound like you? 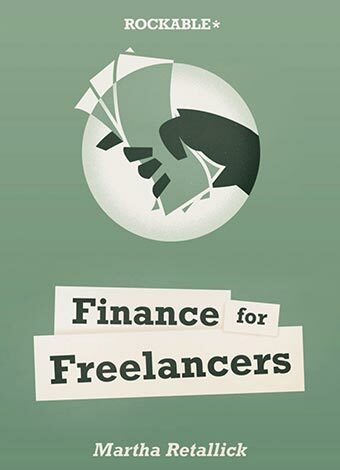 Well, Finance for Freelancers to the rescue! CHAPTER 1: Exactly what is finance for freelancers? Learn exactly what's involved in bookkeeping, accounting, and business funding. You'll be very pleased to learn that your computer easily does the math for you. (Hey, they don't call them computers for nothing!) And that it's easy to train your brain to do the thinking and decision-making based on what your business numbers are telling you. Since creative freelancers are already quite used to dealing with computers, the notion of adding another software program or online service to the mix isn't terribly frightening. The trouble with a lot of computer-based accounting software programs is that they're way too bloated for us. This chapter shows you how to choose accounting apps that aren't loaded with things we don't need. It also walks you through key bookkeeping tasks like billing, making payments, and tracking time spent on projects. It’s important to find and work with a good accountant, and this chapter will show you how to do that. It also guides you through the key financial reports for your business – and how you can make decisions based on what the numbers are saying. If you're thinking of starting a freelancing business, where are you going to find the money to do so? Will you start an “I Hate My Job” fund and save part of every paycheck? And, as your job hatred increases, so does the amount that you save? Or are you going to seek loans from family, friends, and commercial institutions like banks? This chapter will help you decide. One of the easiest ways to run into freelancing trouble is when the money isn't coming in fast enough. And, sad to say, the blame for some of this trouble lies with the freelancer. The solutions? They're discussed in this chapter. American Supreme Court Justice Oliver Wendell Holmes, Jr. is reported to have said that “Taxes are the price we pay for a civilized society.” The tax accountant's corollary is “Don't pay more than you absolutely have to.” This chapter discusses how you can handle the ongoing joys of filing tax forms, what to bring to a meeting with your tax preparer, and setting aside money to pay taxes. Since the goal of being in business is to make money, freelancers will need a place to put their money. This chapter will discuss the advantages and disadvantages of large banks and small banks, online-only banks, non-bank institutions like credit unions, and online payment processors. For many creatives, “budget” is one of “Don’t Go There” words. But we’re going there, and I promise that it will be a worthwhile experience. As a self-employed professional, you’ll encounter quite a few sales pitches for investments. Some will be worth pursuing. Some aren’t. This chapter explains the difference. CHAPTER 10: How will being financially literate help you? Face it, freelancers aren't known as numbers people. Becoming one of them, even if it's just from the perspective of knowing your own business' numbers – and how to act on them – can take you a lot of places. This chapter shows you some of those wonderful destinations, and I'm sure that you will create many more. Here's a collection of books, online communities, websites, and blogs that will help you become a freelancing financial ninja.